David Bohm was an eminent quantum physicist. Early in his career he worked with Albert Einstein at Princeton University. With Yakir Aharonov he discovered the Aharonov-Bohm effect. He was professor of theoretical physics at Birkbeck College, University of London and author of several books on quantum physics. He died in 1992. The David Bohm Society. The holomovement is a quantum field (QF) outside of space-time in which everything exists simultaneously as a unified whole creating a seamless, multidimensional field that is imbued with consciousness, intelligence and meaning. The QF is a vast sea of light energy in a state of constant flux and is the ground for all that is. The fundamental reality thus created is a unity that is causal but nonlocal. This means that events arising from the holomovement are determined but are independent of space and time (see two Figures, at end). Creativity has its roots in the super implicate order, which is governed by the super quantum potential where possibilities are infinite. The super quantum potential is the source of the processes, laws or principles that give rise to the forms that are taken on by quantum potential (Q), which gives rise to implicate orders. Creativity is expressed through the QF as it generates implicate orders in a manner that could be compared to the way in which a fractal algorithm generates ordered forms in a seemingly random process. The QF is permeated by and is in correspondence with Q from which both waves and particles arise. Q acts on the entire QF and relates every particle to every other particle. Q does not carry energy but rather information. The effect that Q has on a particle is determined by Q’s form and the information carried by Q determines its form. Form is the structure, pattern, shape or organization conferred on a particle by Q. It is distinct from the particle itself and is analogous to the way the rules of syntax are independent of a sequence of words forming a sentence but guide its formation. Thus, Q can be thought of as the formative cause that guides the activity of a particle. Order is dynamic and controlled by the information available in a specific context. What appears random in one context will be seen to be part of an ordered pattern in a broader context where more information is available. For example, evolutionary theory attempts to create an orderly description from apparently random events. Bohm’s model, however, suggests that what appear to be random events are actually embedded in a higher order that provides a broader context in which the random events become part of an orderly pattern. Order exists along a spectrum of orders that represents an open and potentially infinite system. For example, when a mystic perceives the reality of an implicate order, the mystic’s context has been enlarged or broadened. However, the level of detail or content available will be less than that perceived by a physicist from the context existing in the corresponding explicate order. Bohm’s second implicate order. The subtle level of formative, organizing and creative activity. The “blueprint” for the material order. Bohm’s first implicate order (first in the sense of being the first level above the explicate order). At this level particles (the basic building block for matter) undergo rapid creation and annihilation causing matter to appear to be blinking on an off. Particles are created by the convergence of waves in the QF causing an interference pattern or ripple referred to as a wave packet. The process described as “blinking” is also referred to as enfolding and unfolding and as projection and injection. A particle is explicated, unfolded or projected into the explicate order and then implicated, enfolded or injected back into the implicate order. One complete cycle is called a moment. The more rapid this process the greater the appearance of seamless continuity as perceived from the explicate order. It is the unfolding of the implicate order to produce the explicate order that creates the perception of time. The more separation between unfolding and enfolding the less apparent is continuity and the more events appear to be random. For example, when an electron appears to “jump” unpredictably from one position to another, the amount of separation in the electron’s moment causes it to display what appears to be random, discontinuous activity. One way that this can be thought of is as a series of photos. When presented slowly, one merely has a set of individual pictures, which may appear random. When presented rapidly, one has a movie. Three dimensional reality is a derivative of multidimensional reality. The appearance of direct causal connections in the explicate order are actually representations of relationships in the implicate order. Bohm’s model indicates that space-time was enfolded into the implicate order and was explicated in a pulse of light energy (comprised of all waves that move at the velocity of light). This pulse is now described as the big bang, which brought our expanding universe into existence. In some ways, matter can be thought of as condensed or “frozen” light. Since the QF is infinite and eternal, there is no reason to doubt that there are other universes created in the same manner. Physical (soma) and mental (significance) are reciprocals of one another and there is a two-way flow of energy and information between them. Each significance has a corresponding soma structure. The relationship between soma and significance is meaning. Meaning is roughly equivalent to consciousness and spreads out over a spectrum. Consciousness thus is implicit in all matter in 3D reality but consciousness is not equivalent to self-awareness. The deeper meaning is enfolded into the implicate order the more subtle it is. The perception of shades of subtle meaning requires insight and cannot be attained through analysis alone. A change in meaning changes soma and a change in soma changes meaning. Content is meaning extracted from a given context. Formative cause is similar to meaning and gives form to the activities of an entity as well as goals toward which the entity is moving. In a sentient being consciousness is its formative cause and thus a sentient being has the ability to self-direct its activities and the goals toward which it is moving; i.e., the being can exercise free will. The manifest world provides a display. The 3D world then is like a computer monitor that allows the display of relationships between objects and events that are free to vary and create new relationships within limits imposed by the underlying software. Having a display allows consciousness or intelligence to become active. Recall that the pulse between the implicate and explicate order is two-way. 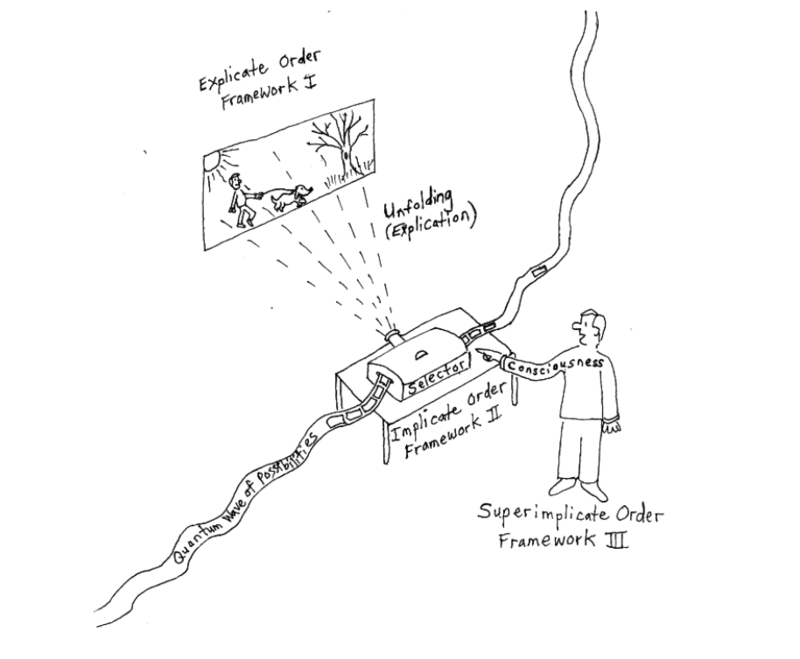 The explicate order enfolds or injects information back into the implicate order. The implicate order then assimilates this information and incorporates it into what is unfolded or projected into the explicate order. The holomovement appears to be experimenting and thereby learning or evolving. 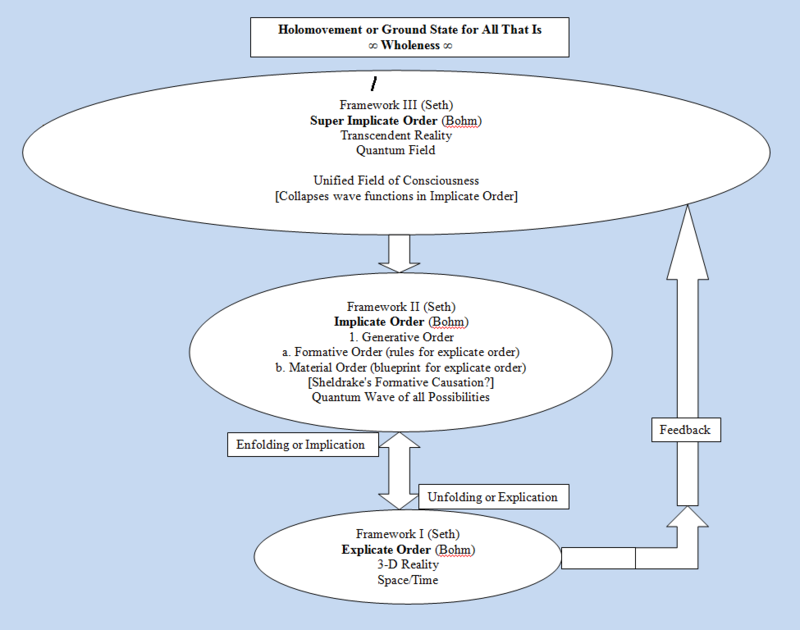 A process that implies purpose for the 3D universe. The above is my less than complete understanding of the presentation of Bohm’s reformulation (or interpretation, if you prefer) of quantum physics taken from the section on Bohm in: Friedman, Norman (1990). Bridging Science and Spirit: Common Elements in David Bohm’s Physics, The Perennial Philosophy and Seth.